Whether you are building or renovating in the Grand Rapids area or along the Lakeshore, our company offers an impeccable, worry free experience as we take your ideas and make them realty. At Cutting Edge Builders, we help you Dream, Build, Live. At Cutting Edge Builders, we build a home that sets us apart from the competition. We firmly believe a great home starts with true craftsmanship in the framing stage. In the past, a craftsmen carpenter paid as much attention to detail in every aspect of his work whether he was framing or trimming. Cutting Edge took our dated, 1980's vintage house and transformed it into a vibrant, current, and comfortable home. Nate, Tom and Doug listened to our needs and wish-list items to create an innovative design. Their craftsmanship and attention to detail are outstanding. As a bonus, they are responsive, professional and enjoyable to work with. 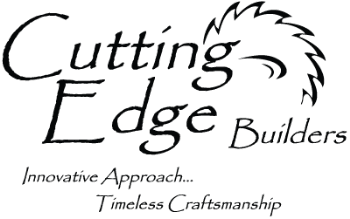 Cutting Edge is an exceptional design-build firm. They did a wonderful job of combining our ideas with their expertise. Beautiful workmanship! We would like to thank you and your crew at Cutting Edge Builders for helping to transform our home last summer. Our project may have started out as a complete kitchen remodel but it evolved into something much greater. Our home is so warm and inviting now. We can’t believe it’s the same ‘80s house. We have received numerous compliments about how beautiful our home has become. Your team really delivered, on time, on budget and they were a pleasure to work with! We look forward to working with Cutting Edge Builders for our future remodeling projects.